Designed for Nokia mobile phones, 4Media Nokia Ringtone Composer can convert a great number of video and audio formats like AVI, MPEG, WMV, DivX, MP4, H.264/AVC, AVCHD, MKV, WMA, WAV, M4A to MP3 music files for your Nokia mobile phone as a Nokia ringtone converter, and upload ringtones to Nokia mobile phones after conversion. 4Media Nokia Ringtone Composer provides all the Nokia mobile phone lovers with the best solution to make Nokia ringtone and transfer ringtone to Nokia mobile phone. Owning a wide range of supported video and audio formats like AVI, MPEG, WMV, DivX, MP4, H.264/AVC, AVCHD, MKV, RM, MOV, XviD, 3GP, WMA, WAV, RA, M4A, this Nokia ringtone converter can compose Nokia ringtone in MP3 format from any movie and music. Also as a Nokia ringtone uploader, 4Media Nokia Ringtone Composer will upload the converted MP3 ringtones to Nokia mobile phones automatically after making MP3 ringtone if you want. Clipping music segment and listening to the music clip help you create Nokia ringtone that you really want. No other ringtone maker for Nokia mobile like 4Media Nokia Ringtone Composer has so terse interface and rich format support that you can make Nokia ringtone from any media files just at a glance. 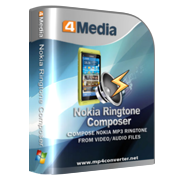 4Media Nokia Ringtone Composer supports converting a variety of audio formats including WMA, WAV, RA, M4A, AAC, AC3, OGG, etc. to MP3 files as Nokia ringtone, e.g. convert WMA to MP3. With this Nokia ringtone converter, you can also make Nokia ringtone by converting any video formats like AVI, MPEG, WMV, DivX, MP4, H.264/AVC, AVCHD, MKV, RM, MOV, XviD, 3GP, etc. to MP3. Let the Nokia ringtone uploader upload the converted MP3 ringtone to your Nokia mobile phones automatically after making ringtone, then you will hear the ringtone when your friends call you. Any music segment can be extracted and converted to Nokia ringtone just by setting segment start time and end time. 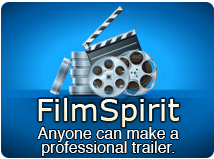 To ensure the converted music clip is just what you want, you can listen to the music with the built-in music player before converting to MP3 file. The Nokia ringtone converter is so easy to use that you can make Nokia ringtone from any video/music file within two steps: just add a file and convert it! English, German, Japanese and Chinese interface languages are provided to meet different mother-tongue users in 4Media Nokia Ringtone Composer. How to make a MP3 ringtone and transfer it to your Nokia phone?